Students on the Manti High School speech and debate team show off trophy and medals they won in the Templar Trials Tournament last Saturday, June 12. At far right are Coach Eric Peterson and his family. MANTI—The Manti High School speech and debate team took first place at the Templar Trials Tournament on Saturday, Jan. 12 at Manti High School. Teams from Richfield, Carbon, Delta and Emery competed against Manti. 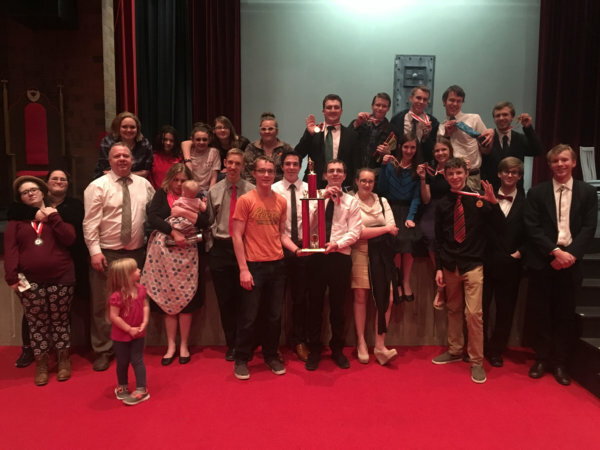 The tournament is one of several in what is known as the Central Utah Speech and Debate Circuit (CUSDC), which typically draws students from schools in Sevier, Millard, Juab, Carbon, Emery, Beaver and Sanpete counties. The CUSDC is designed to prepare students for region speech and debate competition. Winners in the Manti tournament included Josh Peterson, first place, and Abby Watson, second place, in impromptu speaking; Chandler Williams, second place, and Sam Young, fourth place, in oratory; Taylor Palmer, second place in foreign extemporaneous speaking; and the team of Taylor Palmer and Zach Brown. first place, and the team of Easton Cluff and Don Southworth, second place, in policy debate. Other Manti High winners included Josh Douglas, first place, and Matt Bigelow, second place, in humorous interpretation; Andrew Olson, third place, dramatic interpretation; and the team of Mellissa Peterson and Ellie Anderson, second place, for duo interpretation. The Manti speech and debate team will travel to Richfield on Saturday, Feb 2, for the last CUSDC tournament. According to Eric Peterson, speech and debate coach, Manti took first place in the circuit last year and is hoping to take home the trophy again.